Front Suspension 43mm Telescopic forks. The 900 Sprint, like the rest of the Triumph range, is part Superbike, part miracle. After the once-mighty British motorcycle industry self-destructed during the '60s and '70s, the prospects of regeneration on anything like its former scale were as likely as an (old-style) Triumph twin that didn't vibrate or leak oil. True, there had been occasional flourishes from the likes of Norton and Matchless, but these were very small scale and, it turned out, ill-fated. Triumph is different. To date John Bloor, the Midlands builder who owns the new company, has sunk around £80 million into the venture. The Hinckley, Leicestershire factory is as modern and efficient as any in the world. 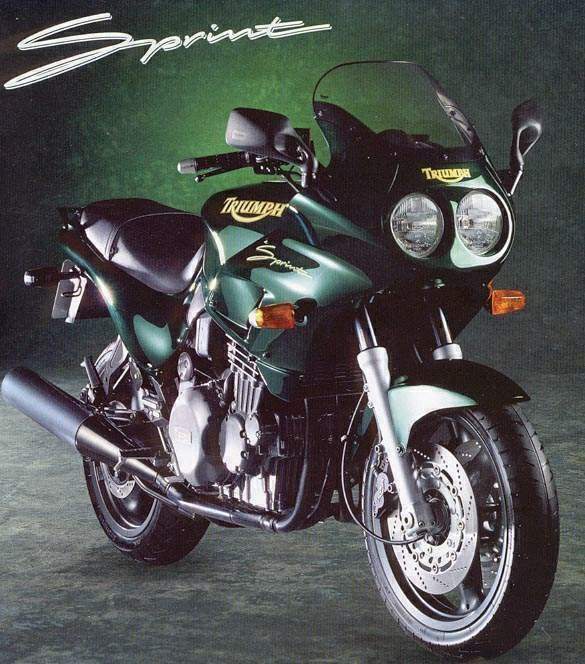 Its state-of-the-art computer-controlled machinery will produce well over 10,000 motorcycles during 1995. And, most important of all, the product is good. The Sprint is a case in point. It eschews race replica performance, in favour of a formula which simply works. Yet originally it wasn't even Triumph's idea. 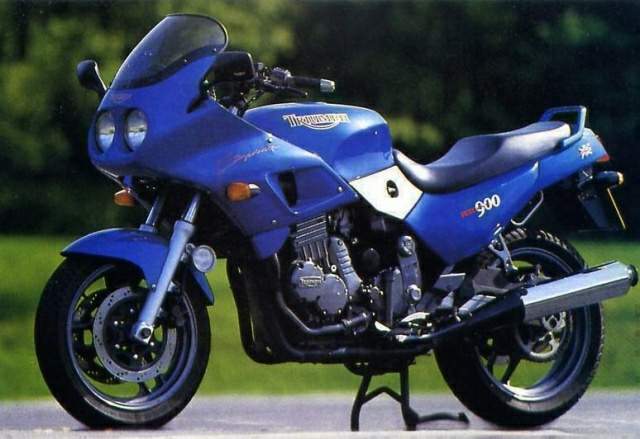 When the naked Trident range first appeared in 1991, a number of customisers, notably in Britain and Germany, produced a half-faired variant. 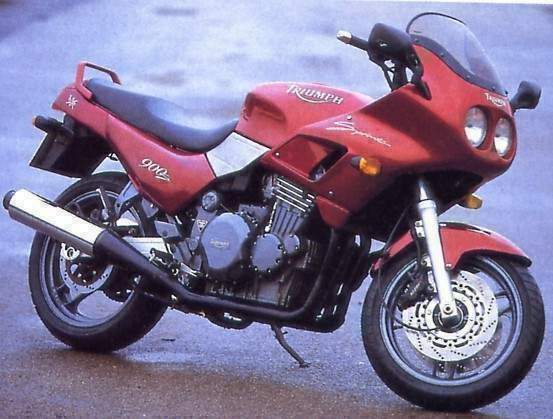 One year later Triumph themselves responded with the Sprint. But there was a difference. Where the 'unofficial' Sprints had simply been modified Tridents, the official version was actually more of a defrocked version of the fully-faired Trophy. So from the outset the Sprint had the Trophy's dual-rate front springs and both pre-load and rebound damping adjustment at the rear. Although still too softly sprung for out-and-out sport riding, the latter is a useful bonus, allowing the suspension to be fine-tuned to suit conditions. On maximum damping, there is less of the mild wallow to which the unfaired bike is prone. The result not only looks like a motorcycle ought, but makes for a versatile and practical all-rounder. Highish 'bars and lower seat offer a riding position as relaxed as anything this side of a fullblown tourer (and better then several of those). Once you've become used to wielding the wide 'bars from low behind the bulbous tank, the bike is beguilingly easy to control. The half fairing largely eliminates wind fatigue. For long trips by motorway or fast A-roads, it is almost indispensable. As well as the rider, the fairing gives the engine an easier time. 100 horsepower shoving a naked Trident through the air has a much tougher time than the same power pushing a comparatively slippery fairing. As with the 900 Daytona, the simple appliance of a dash of aerodynamics makes an already potent engine seem even stronger. In just a few short years we have come to expect a high standard of finish from Triumph, and the Sprint does not disappoint. The quality of paint and plating is as high as anything in motorcycling, BMW included. Carburation and clutch action are equally refined, and the gear change is superbly precise. And the three-cylinder engine, of course, is special: flexible, inexhaustible and strong. It thrives on revs, yet punches hard through the mid-range. Like all its siblings, it employs a balance shaft to reduce vibration, but not at the expense of 'character'. Somehow, something distinctive gets through to the rider. You can't quite put your finger on it, but there's a rumble, a cadence, something, which says 'I am not a four, and especially not a Japanese four: I am different'.